This paper aims to analyze the relations between the European Union, the projection of its values through the European Neighbourhood Policy (ENP), and the contribution of the local non-governmental organizations (NGOs) to the process of accepting, internalizing and spreading the values of the EU in the Republic of Moldova. The context in which this paper is elaborated was set by Moldova's inclusion in the ENP, the political debate generated by the possibility of future EU integration, and the Communists' loss of power in July 2009. The main idea underpinning the entire research process is that an active and vibrant civil society represents a conditio sine qua non for a fully functional democracy, which is a goal set by the ENP for Moldova and its current and future relations with the EU. 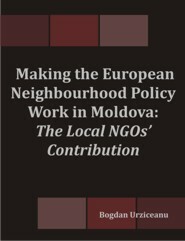 Moreover, during the pilot study conducted in 2008 several Moldovan NGOs claimed they represented and supported the European Union's values and beliefs and, consequently, the representatives of such organizations were convinced that they were acting as promoters of the EU in their relation with the rest of Moldovan civil society, the public institutions and political parties. In order to achieve this paper's goal, a comparison is made between the ENP Strategy Paper and the official statutes of eight Moldovan NGOs vis-a-vis the core European values set by the Policy. This step is followed by in-depth semi-structured interviews with representatives of various Moldovan NGOs and by a focus-group with Moldovan students who provide crucial data regarding the organizations' efficiency and effectiveness of spreading and enhancing the EU's values in Moldova. Bogdan Urziceanu holds a BA in Political Sciences (2008) and a second BA in Communication and PR (2009), both obtained at Babes-Bolyai University Cluj-Napoca, Romania. He earned his first MA in European Studies at Universiteit van Amsterdam (2010) which was followed by a second MA in European Public Affairs (2011) after graduating a Master's programme designed by Maastricht University in partnership with the European Institute of Public Administration. With a keen interest in civil society development, democratization process, EU affairs and international relations, Bogdan Urziceanu worked as a volunteer coordinator at Asociatia Pro Democratia Cluj-Napoca, as an election observer for Asociatia Pro Democratia and the European Network of Election Monitoring Organizations, and as an intern at the Romanian Information Centre in Brussels, a diplomatic institution that functions under the authority of the Romanian Ministry of Foreign Affairs. His academic research is mainly focused on the democratization process of post-totalitarian states, civil society, civic participation and the external relations of the EU.